Located in West Philadelphia, Mill Creek Farm is an educational farm whose mission extends beyond the farm's half acre. As the farm's website explains, "we envision a world in which everyone has access to affordable, healthy, culturally appropriate food, and were local communities work collaboratively to build a food system that is socially just and environmentally and economically sustainable." Want to be a part of Mill Creek Farm's mission? Join one of the interactive tours or community skill-share workshops hosted on the farm! 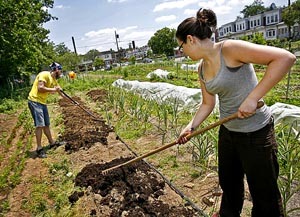 The cover story for the April 29th, 2010 City Paper is all about Philly's urban ag movement. Mill Creek Farm co-director Jade Walker chimes in towards the end. NBC 10's Byron Scott stops by the Mill Creek Farm at the beginning of our 2010 growing season to profile the farm and Campus Philly's Alternative Spring Break program. Terry Gillen of the Redevelopment Authority clarifies RDA's relationship with urban farming initiatives in Philadelphia. Even though I’ve been growing two heirloom tomato plants in my backyard all summer, I haven’t tasted a single tomato from them yet. Now it’s autumn and the tomatoes remain stubbornly small and green — nothing like the voluptuous red beasts advertised on the seed packets. I knew my resources were limited but I planted and watered with dedication. Let me describe the landscape. "WE'RE out here in the dirt all the time," said Jade Walker, standing amid the patch of topsoil on Brown Street near 49th that keeps hunger from the doors of neighboring homes in the recession-ravaged Mill Creek section of West Philadelphia. "And every time we're out here," Walker said, "people are coming up to us, struggling with the idea that they can't provide for their families the way they want to right now. People who have never gardened before want to start a garden in their own back yard. Or they want to work here in this one." Walker and her co-director, Johanna Rosen, said that the pocket-size half-acre they call "Mill Creek Farm" feeds hundreds of low-income neighbors - many of them elderly, living on government assistance. As the recession's double-whammy of skyrocketing food prices and massive job losses raises the threat of hunger for thousands of city families, urban mini-farms from the Southwark Queen Village Community Garden to Las Parcelas, in Norris Square, put organic vegetables on many tables and donate their surpluses to keep overburdened church food cupboards from going bare. Can Okra Save the City? Blog post in response to Daily News article "The Little Half-Acre that Could"
Earth to Philly readers are no strangers to the phenomenon of urban farming. Today readers of the print version (as well as online) were treated to a comprehensive story by Dan Geringer on a mini-farm in the midst of the Mill Creek neighborhood in West Philly. Part of the emphasis is on getting food to people who are living close to the bone, including those within a block of the farm. In the process, this extensive garden is not just putting food on tables but showing the neighborhood and the wider city how green ideas can be both inspiring and friendly to your wallet. “A lot of people assume that ‘organic’ means ‘expensive’ because it is so labor intensive,” Johanna Rosen, co-director of Mill Creek Farm, told Dan Geringer. “But our mission here is to provide fresh, low-cost vegetables to our neighbors — many of whom are seniors who use food stamps and other government assistance,” said her co-director, Jade Walker. The half-acre farm, with a permanent staff of just two, feeds the neighborhood. “Most of the folks around here were originally from the South and come from a rich tradition of people growing their own food,” Walker said. Read more about Can Okra Save the City? Check out an audio clip of an interview with Johanna Rosen by WXPN's Michaela Majune. Mill Creek Farm is not much different from any other farm. Patches of okra, cherry tomatoes, eggplant and more than 50 other crops rotate with the season. The smell of basil permeates the air, chirping crickets are the closest thing to noise and the greenness of the crops can blind your eyes on a sunny day. But there's one big difference. Mill Creek is located on just a half-acre of land - in the heart of West Philadelphia. "Glimpses from 2008" -- Scenes from our summer bar-b-q, garlic planting, market stand and more! "Mill Creek Farm on NBC 10 #2" -- NBC 10 stops by the Mill Creek Farm at the beginning of our 2010 growing season. "A Postcard from Mill Creek Farm" -- Part of the Messages in Motion project. "Kripa and Heather"-- A "field interview" with two of our wonderful interns. Also shot as part of MiM. "Queer Farmer Film Project" -- A trailer for a soon-to-be-released documentary about the dynamic relationships between gender, sexuality, and agriculture.